I am really excited about the barn spaces, tucked into the spaces under the pitched roof, with the magical feeling of roof windows and secret views. Tile choices will remain similar to those of the other bathrooms, with white finger tiles and pale grey floors, and brushed brass taps from Brodware. Loving this pendant light right now, the brass piece can be twisted around the glass sphere to focus how the light falls. Simple spaces, flooded with light, the end. Drama drama drama. 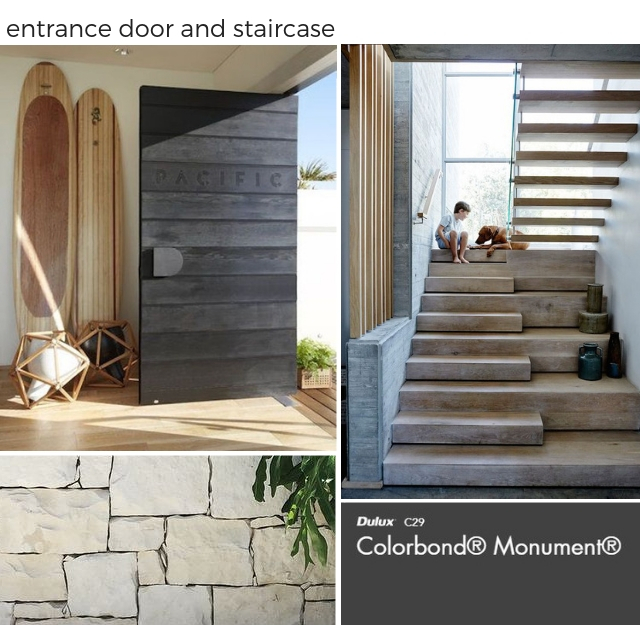 Contrast is what this entrance is all about. The black barns, the stone detail, the green planting. Colorbond in Monument will make up the barn walls. The stone detail leads you to the front door and there will be some great lighting washing the walls at night. 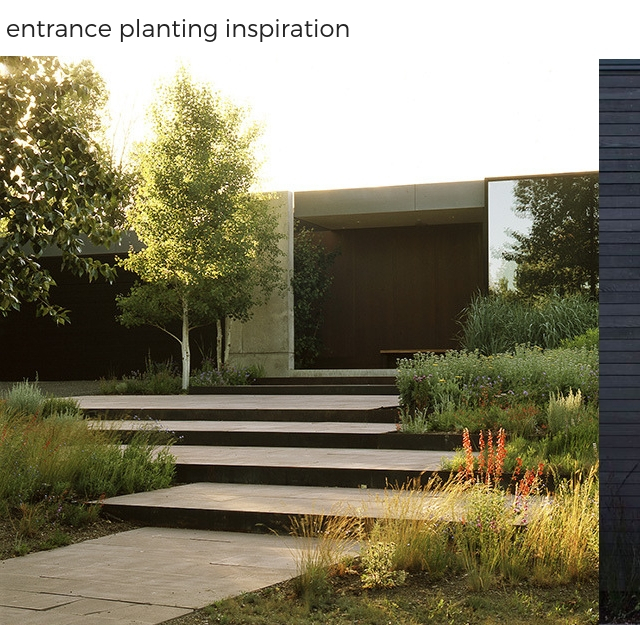 I imagine the planting as soft plants within very geometric beds, inspired by this entrance by Lutsko Associates below. Once you get through the front door (I love love this black door below) on your right will be a staircase something like this one (below right). Loving the crisp feel of the contrasting textures & colours. I was getting super confused about this room until my good friend Bina suggested I limited the materials. Mim Design is my inspiration again (below right) with this textured luxurious space. Our room is smaller but I want to create the same feeling. 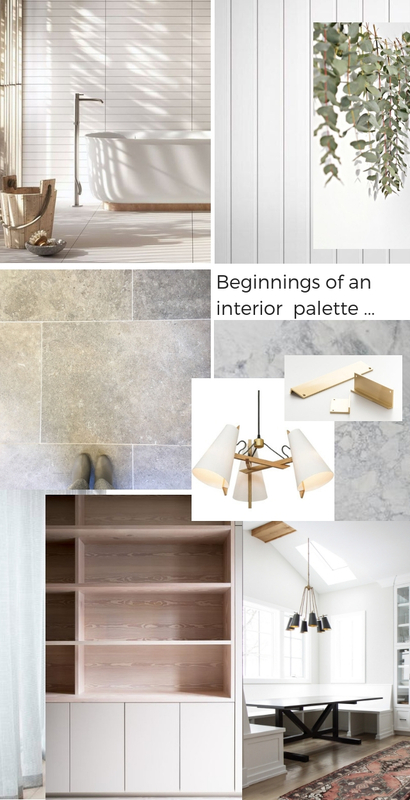 The materials are going to be very similar to those in the master bathroom to create a sense of continuity throughout the whole house. In this room we are using plain white finger tiles to set off the marble look porcelains. Fresh and modern but very classic too. 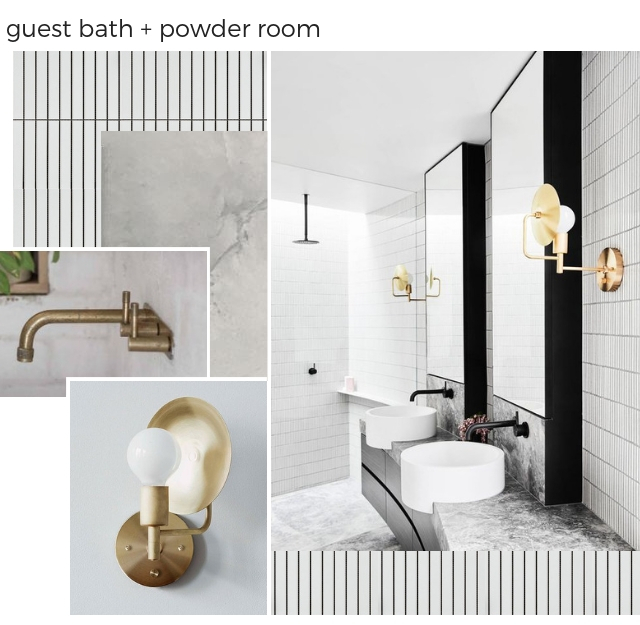 I am totally obsessed with the sconce by Workstead, but working with a lighting designer this past weekend opened my eyes to another option. So after thinking this plan was final final, turns out the lights might change. We know that although small, this layout really works, the footprint is identical to the bathrooms we had in a previous home, with a few decorative changes. Firstly a shelf runs the full length of the bathroom which allows us to recess the toilet into the wall, plus creates a place to stand soaps and shampoos at the basin and in the shower. Second, the lighting is going to be better. We are working with a lighting designer which is going to make sure we get the most of out each space, more on that process soon. He suggested we replace the scone with pendant on the right of the basin to reflect light and shadows off the walls. I like, we want to create moodiness, and he showed me a pendant that is just perfect. Just goes to show you can never call a plan final until it is completely installed. Been sifting through my huge inspiration boards making a final short list. I kept coming back to the same images for the bathrooms, many of them by Mim Design. But the one above (bottom left corner) is still one of my faves. 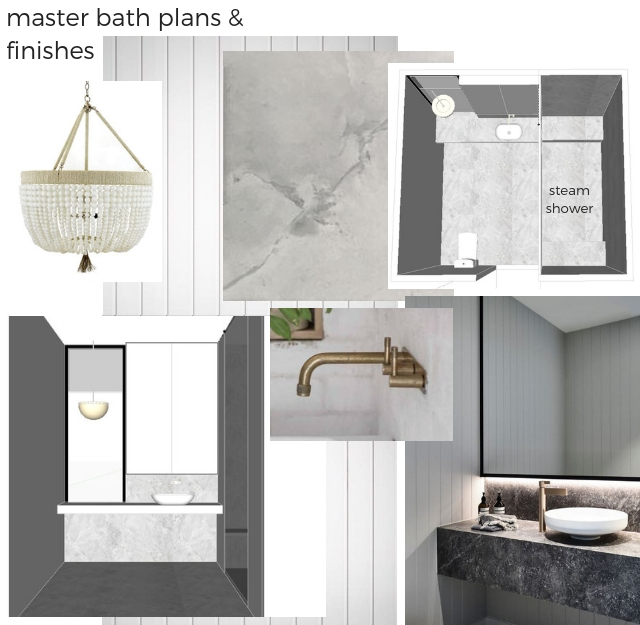 Our main bathroom is not huge but I hope it will have a luxe feel, with a steam shower with seats at each end, views out onto the hill, and lovely stone look floors. 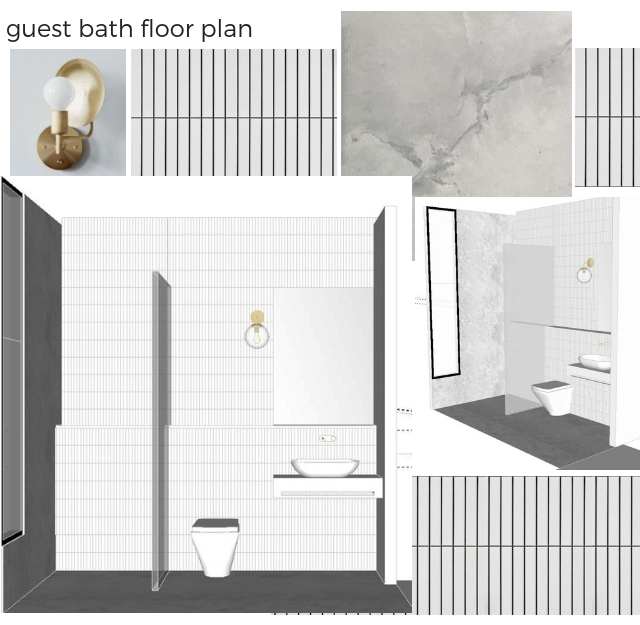 The finishes are very simple: white boards on the walls on the left and behind the toilet (they look gray in my sketches), marble look tiles that will wrap the steam shower and floors, & brushed brass taps from Brodware. The pendant needs to be something special and I love the ones from Ro Sham Beaux which are not in my budget. Will keep searching. I want the mirror cabinet to be edged with black with a recessed light on the bottom edge, like in the Mim Design above. Feels to be good to moving from inspiration to definite decisions. Can't wait until we actually start building. 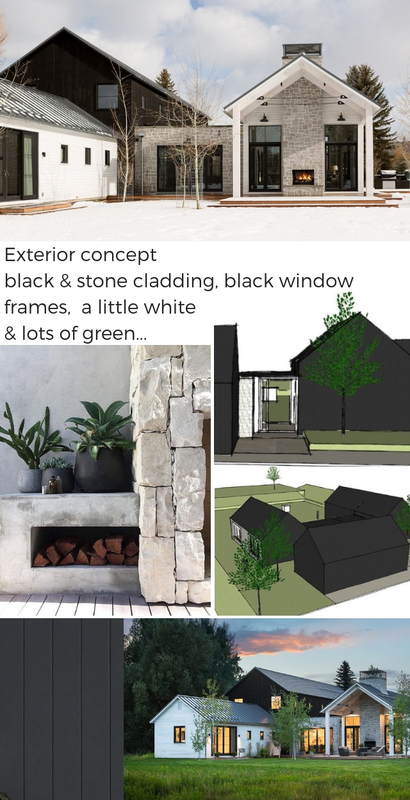 Its going to be very simple, lots of light, lots of white, some wood, some stone, and tons of green through the windows. I just found the perfect exterior inspiration!! It confirms what I have been thinking, that the barns should be different and contrasting. I also really like how the white lifts the black and stone detail. I need a bit of white. This is a problem because our council doesn't like white. Hoping I can persuade them that a small dose will be just what the doctor ordered. 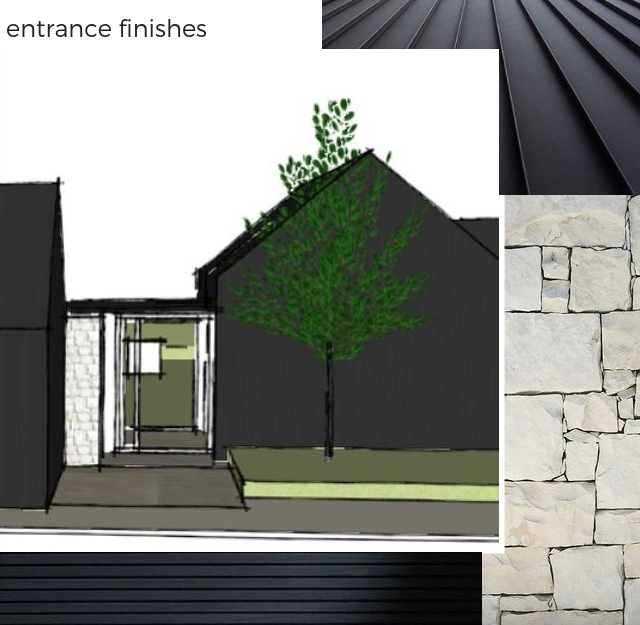 Exterior of amazing property designed by Northworks (top left & bottom right). The interiors were designed by Studio McGee and are worth checking out too. 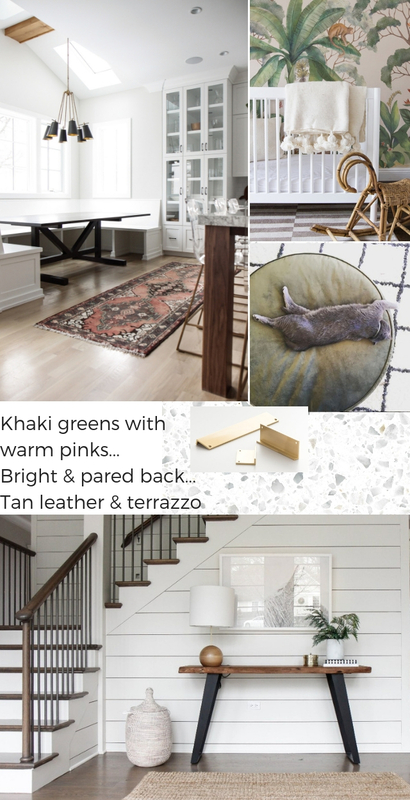 I am still loving the trend in interiors right now, and nothing much has changed in my predictions from last year. Looking back I think I got it spot on and they are worth a look this year too. The only change I see this year is that notes of mustard and blush will be changed for terracotta and rust, and greens have moved from sage to khaki. The light filled, pared back spaces of the Australian & Californian styles is still growing. This look is far less monochrome than the Scandi style of two years ago, and I personally love the life that adding texture and colour gives to these spaces. Velvet furniture is still here but I think we will start to see a move to less formal linen slip cover pieces. Don't get me wrong I am still loving velvet and intend replacing my scatter pillows with a gorgeous gold green velvet I spotted last year. Directors chairs, or sling chairs, will never go out of style and look wonderful with this look. Wicker and brass, or other brushed metals, are here for the year at least. Two trends I am really not sure about are fireclay style tiles and terrazzo. Don't get me wrong I think they look fabulous (see a really great example here) but I am not sure about their longevity. 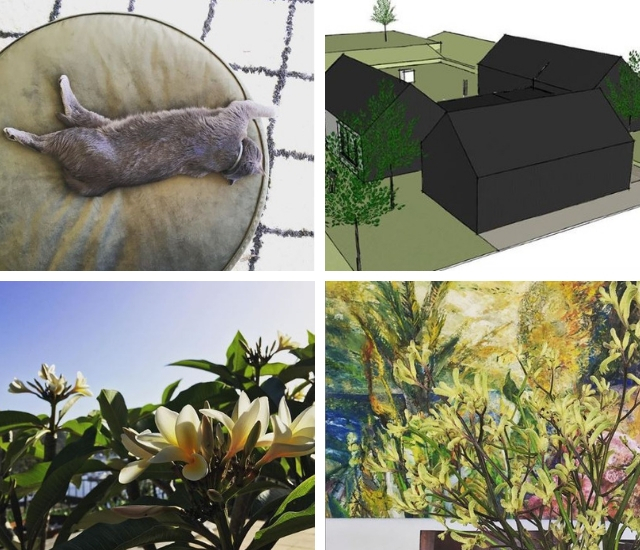 I would do them in a mid century home for sure, but not sure about in other style of homes where they may date quickly. Terrazzo you can at least do in a neutral shade and I like the texture, but I would be careful where and how it is used. There is a distinct move towards the bespoke, the upcycled, the preloved. Choosing items you will love longer term is good for your wallet and the environment, and people are buying quality items, and pieces that can be used in different rooms over the years. Mixed with budget buys this creates an individual style that doesn't look store bought. As always: buy what you like, love and use, let go of what you don't, and it will all work out. Spending time at our cosy country cottage always makes me reassess. It is a little house and I have consciously furnished it in a restrained colour palette and only what is needed. I always enjoy how easily we are able to live with less of everything. At the end of our stay I listed what I truly miss from our larger city home. Dishwasher - top of the list, especially since the cottage is on rain water only and we have to watch our water usage. A dishwasher would save water & time. The kitchen - just to small for more than 1 person, and more than that, I miss the plates and platters we use regularly, especially when we entertain. The shower - it is totally adequate but more elbow room would be good. A little extra room - just a little so that we don't have to retreat to our bedrooms for quiet and working on projects. A surprisingly small list, especially considering how much extra stuff and space we have in our city home. I am always determined to scale back our possessions once we get home, and then when we get home I find it really hard to actually put into practice. There are things we have collected that I don't want to part with: paintings, books, furniture and objects we really love. After two moves in three years we have cut back a lot, after all there is no point moving something you don't like or use. I was quite pleased to find that mostly I really like what we have, and we use it all. I still feel a little overwhelmed by how much there is though. Even after a large cull there are still two full shelves of vases and candle holders. I do use many of them during the year, and am not quite ready to let them go, but there are a few I just think are pretty and wonder whether I will ever use again. Perhaps I should try and sell the extra bits and put the cash into something I do want. Last year I sold off a lot of unused items and bought extra Mud Australia plates with the proceeds. It was satisfying turning boxes of unused stuff into a few things I love and use daily. We also have a lot of kitchen stuff. Most we use frequently but there are a few large items we only use a few times a year and I kind of begrudge the space they take up. But then again I would miss them on those occasions we need them. I don't begrudge the art, although I know the movers always think how much we have is hilarious. There are some pieces I no longer want on the walls, but they are sentimental, many done by my mother. I will store them so that my girls can have them in their homes one day. I don't begrudge the girls their stuff either. I like their little collections and they aren't forever. They will grow out of them. Although there are two boxes of stuffed animals that my 16 year old just can't part with yet. Maybe this year. So here I am again thinking I just don't know what I can let go of, but knowing that I want to own less.